This example of a blue canvas duck deck sneaker is the always classic Sperry Top-Sider. This example of a white canvas duck deck sneaker is from Pier 54, one of the house brands of Academy Sports and Outdoors. Academy Sports and Outdoors is a sporting goods chain, with stores mostly in Texas, and headquartered in the city of Katy (a suburb of Houston). This yellow deck sneaker is also by Sperry Top-Sider. Sneakers - tires for the feet? Tires, as well as sneakers, are made of fabric and rubber. 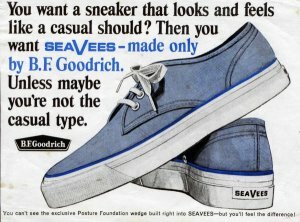 Therefore, there should be no surprise that many tire manufacturers at one time made sneakers (and vice-versa). Interestingly, in South African slang, "tackies" can be either car tires or sneakers. High-top lovers rejoice! Join the canvas deck sneaker crowd! Converse has made canvas duck deck sneakers for many years under the trade name "SkidGrip." However, they only once made a high-top version. As you can tell from the color scheme, the "ConRad" was intended to be "Con-Radical"... and it was! Back in the Baby Boom Days, guys typically wore Converse "Chuck Taylor" All Star sneakers (or clones thereof). 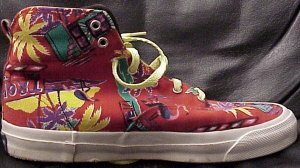 Gals typically wore Keds or similar canvas duck sneakers. 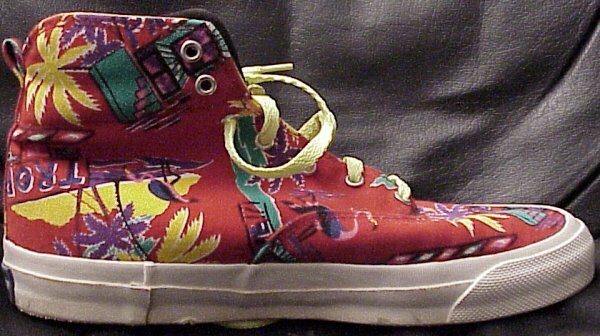 However, both guys and gals had a well-accepted alternative, the canvas duck deck (or "boat") sneaker. Guys liked them because they were a lighter, less constraining alternative to the traditional basketball sneaker. 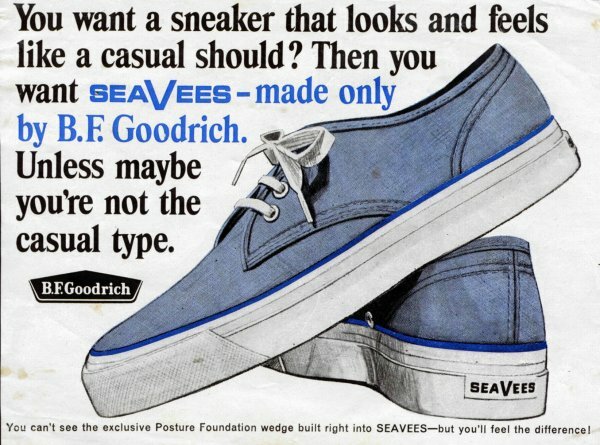 Gals liked them because they were more cushioned and protective than flimsy, unpadded Keds. In Boston, these types of canvas duck sneakers are called "bobos." However, in parts of New Jersey, no-name Converse "Chuck Taylor" All Star clones are called "bobos." Many deck shoe models now are specially treated leather or high-tech synthetic fabrics (like polypropylene) as they hold up much better under nautical conditions. Many manufacturers (both name-brand and generic) make this type of shoe.